The First Hints Of A Dinosaur's True Colors The colors of dinosaurs have long been a mystery, since soft parts aren't preserved in the fossil record. But for the first time, scientists have teased out colors from fossilized feathers to reveal the orange-and-white ringed tail of a 125-million-year-old dinosaur. An artist's rendition of two Sinosauropteryx dinosaurs, showing their short, bristle-like feathers along the midline of the head, neck, back and around the tail, forming irregular stripes. Scientists have found evidence of some of the original coloration of a dinosaur that lived about 125 million years ago, showing that it had rings of orange-brown bristly feathers around its tail. Fossils have revealed a lot about the lives of dinosaurs, but researchers always used to think that the fossil record couldn't show what color they were. "This was the one point at which we had to give up," says paleontologist Mike Benton at the University of Bristol in the United Kingdom, who explains that fossils tend to preserve an animal's hard parts, like bones and teeth, and not soft parts like skin. But feathers are made of tough proteins. "And, in fact, they can survive even in conditions where other internal organs, you know, muscles and guts and brains and so on, will disappear," says Benton. That created the possibility of learning something about what colors could be found in the primitive feathers of early birds and recently discovered feathered dinosaurs. Unfortunately, these fossilized, ancient feathers just look like rock to the naked eye, because of the way they were preserved. "When you look at the feathers, you don't know what the colors were. The feathers are a mixture of brownish colors," says Benton. "They're just preserved either as sort of dirty, whitish, beige kind of color and a kind of darker, equally dirty kind of brownish color." 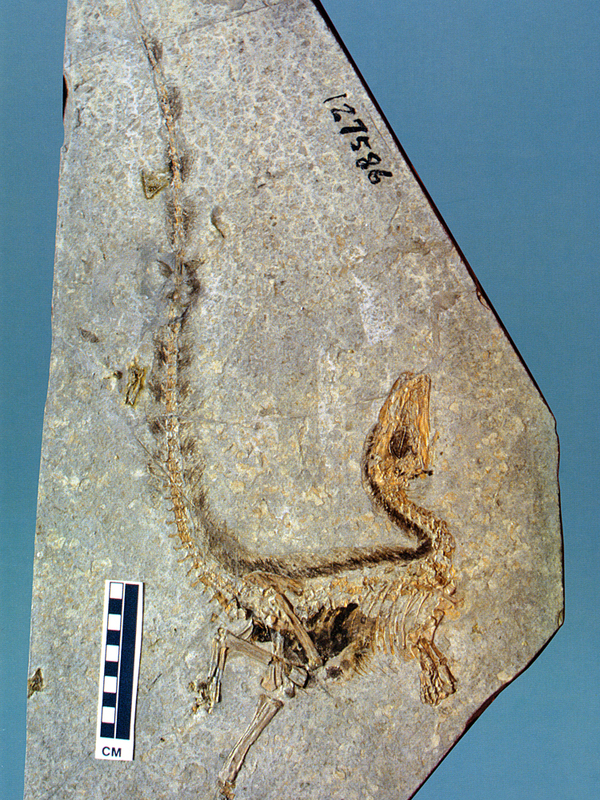 The fossil of a small Chinese theropod dinosaur, Sinosauropteryx. But Benton and his colleagues thought they could get clues about the original color by looking at tiny structures inside these fossilized feathers. After all, they knew that in the feathers of living birds, some color comes from pigments called melanins. And inside of a hair or a feather, "the melanin is actually contained within a kind of capsule," says Benton. The shape of the capsule depends on the color. "The black or dark brown kind of melanin goes into a somewhat sausage-shaped capsule," says Benton, while a reddish-brown kind of melanin goes into a more rounded capsule shaped like a ball. 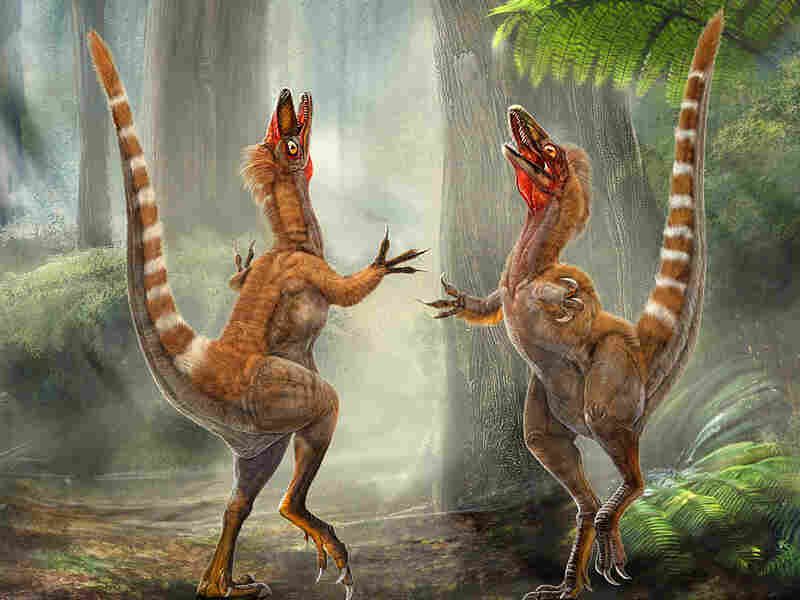 With this in mind, the researchers used a sophisticated, powerful microscope to peer inside primitive feathers on a turkey-sized dinosaur called Sinosauropteryx. "It's a flesh-eater. It's got sharp little teeth in its mouth, and it's got grabby little hands," says Benton. 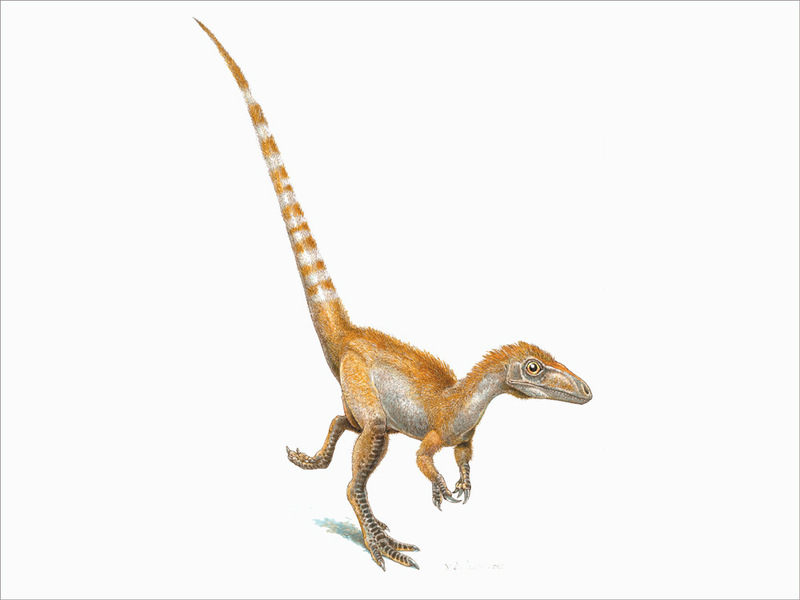 "It's a two-legged dinosaur, so very slender limbs. It's got a sort of straightish backbone and a long thin tail." Fossils show that this tail was ringed with dark bands of primitive feathers that look like bristles. And inside these bristles, Benton and his colleagues found melanin capsules in the shape associated with the orange-brown color. "These dark stripes, as far as we can tell, were exclusively ginger, and so this early dinosaur with its long thin tail had ginger and white stripes up the tail," says Benton. He says they assume the tail must have been completely covered with primitive feathers, with alternating orange-brown and white stripes. The white feathers would not have contained any melanin capsules, which means they would have had less structural strength and would have decayed rather than being preserved in the fossil. "For the first time ever, we have evidence, we believe fairly watertight evidence, of the original color," says Benton. 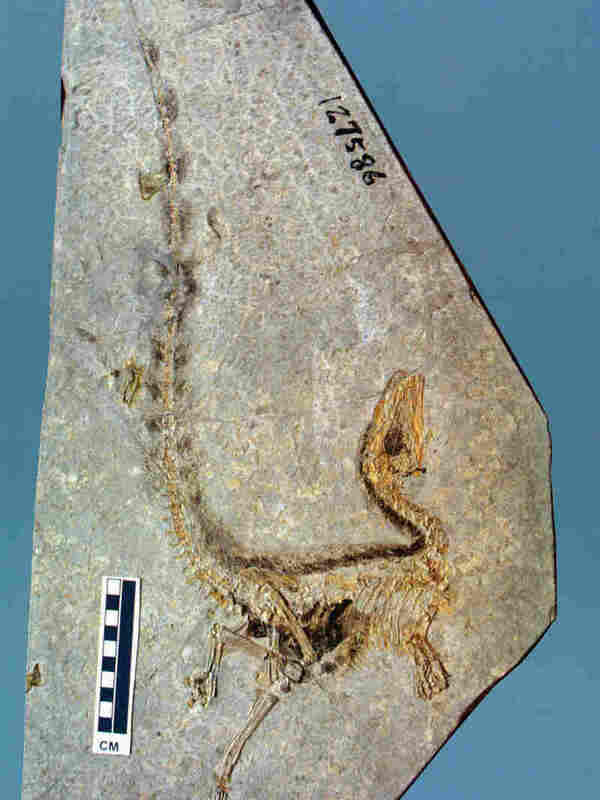 The researchers also looked inside feathers from fossils of the early bird Confuciusornis and found that this species appears to have had patches of white, black and orange-brown coloring. The Sinosauropteryx was a turkey-sized, flesh-eating dinosaur that scientists believe had primitive feathers and dark rings around its tail. Benton's team reported all of these findings in the journal Nature. Other paleontologists said the work was an impressive feat. "This is a really exciting result," says Richard Prum, an evolutionary ornithologist at Yale University. He and his colleagues had previously shown that melanin capsules fossilize very well in feathers. "But that work was based on much more recent fossil bird feathers," says Prum, adding that this new study extends the work to much older specimens from feathered dinosaurs. "This study begins to bring the colors of dinosaurs out of the realm of artistry and into the realm of science," says Thomas Holtz of the University of Maryland. But Holtz says this approach will only be possible for feathers and maybe scales on those dinosaurs that are extremely well-preserved in fossils. That doesn't include a famous one that he studies — Tyrannosaurus rex. "I would love to know if Tyrannosaurus was green or brown or, you know, chartreuse," says Holtz. But he doesn't think that's going to be possible. "It's unlikely that I'll ever know or that anyone will ever know the colors of some of our favorite dinosaurs." For these extinct creatures, at least, it looks like artists trying to create images of a long-lost world will continue to be limited only by their imagination, and not by science.